I’ve never had falafel before, but I’ve always wanted to try it. I never really thought I’d be making it the first time I tried it though. Falafel is a dish that is eaten throughout the middle east, and widely accepted as being first eaten in Egypt. 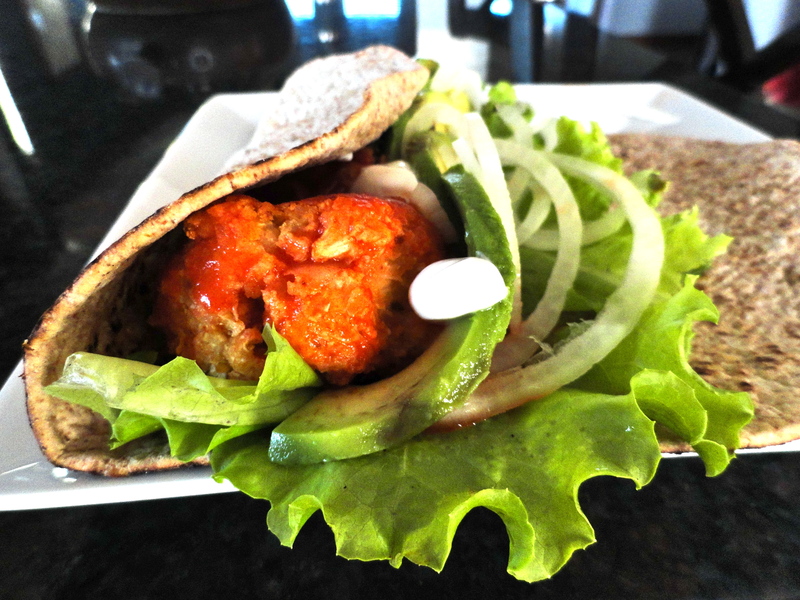 Often served in a pita, falafel is traditionally made of ground chickpeas, fava beans, or sometimes both. The beans are formed into a patty or ball and then deep-fried. Toppings and sauces for falafel can range anywhere from a traditional tahini based sauce to hot sauce or pickled vegetables. Any way you serve it up, I would definitely like to get down on that! I saw this recipe on Thug Kitchen (yes, him again), and wanted to try it right away. Not only because of the buffalo sauce, but also because it was a creative way to use cauliflower. The ground cauliflower and chickpeas are mixed together along with some other seasonings and some breadcrumbs to create the falafel ball. Then, these are baked, unlike the traditionally fried falafel. I didn’t make my own buffalo sauce as was noted in Thug Kitchen, I just went for my trusty stand by, Franks Red Hot. I served these in Flat Outs, though pita bread might have been a better idea to contain the messy. Nate was fairly indifferent to the buffalo falafel, but I liked it. It did have too much cauliflower taste, but I think that was my fault as the recipe called for 1/3 of a pound of cauliflower, and not having a kitchen scale, I just guessed. I thought I may have used about twice as much cauliflower as was necessary. After a little Googling, turns out, I probably used about 4 times as much as necessary! 1/3 pound is only about 1/2 cup. Oh well, lesson learned! Google first next time. I also garnished these with avocado, lettuce, onions, and a dollop of Greek yogurt. 1. Heat oven to 400 degrees. Lightly spray olive oil on a foil lined baking sheet. 2. In a food processor, pulse the cauliflower until it resembles rice. Add the chickpeas and process until it forms a smooth paste. Transfer mixture to a large bowl and add onion, garlic, oil, seasoning and breadcrumbs. The mixture should easily form into balls, but if it’s too dry, add a little water. If it’s too moist, add a little more breadcrumbs. Form balls slightly larger than ping-pong balls and place on prepared baking sheet. The mixture should make about 12. Bake for 20-25 minutes, until they start to become golden and brown. Don’t forget to flip halfway through. 3. 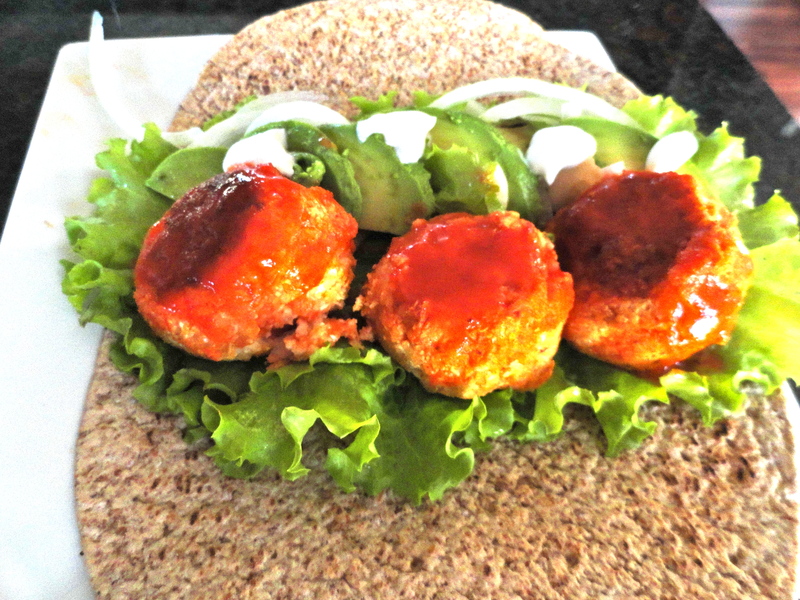 Once the falafel are done cooking, gently push to the center of the baking sheet and coat with buffalo sauce, reserving a little for serving. Return to oven for another 5 minutes to allow the falafel to absorb the flavor. Top with remaining buffalo sauce as desired. 4. 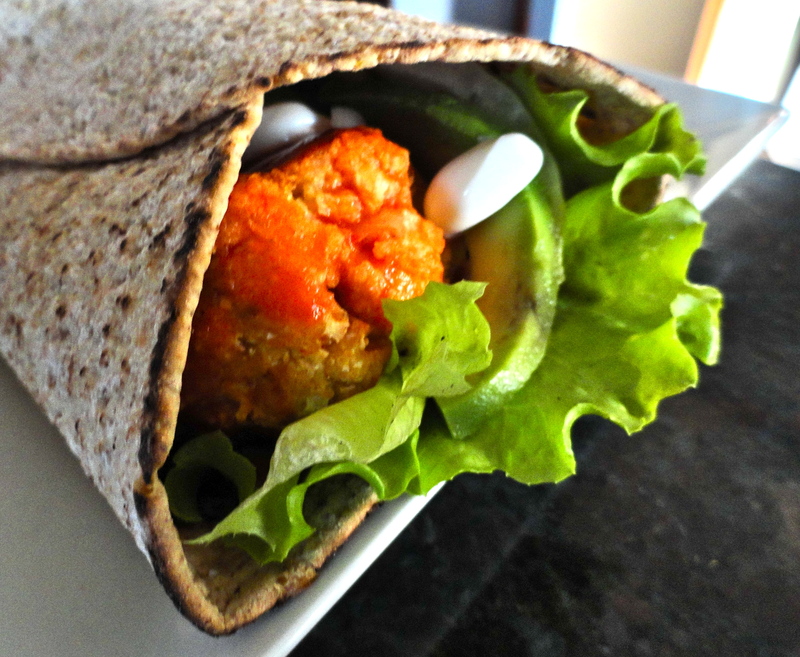 Serve falafel in pita, wraps, Flat Outs, over a salad, or however else you would like it. I added avocado, lettuce, onions and a little Greek yogurt for garnish. Two Meatless Monday’s in a row, and I’m soon to be on fire! Just last week I came across the most hilarious blog that is sure to make you laugh out loud. Thug Kitchen is serving up tons of vegan recipes with even more attitude than a teenage girl. If you haven’t yet visited, you should. Even Gweneth Paltrow is talking about it! Last weekend, I made a double batch of whole wheat pizza dough, separated it out into 8 dough balls, and froze. I was tired of being in the mood for pizza on a Friday, but not having enough time to put the dough together after work and still eat at a reasonable time. I’ve never tried freezing pizza dough before, but I read some where you can do it. If you read it on the internet, it must be true, right? I was planning to make a Mexican veggie pizza for this post, but once I saw Thug Kitchen’s cilantro pesto, I had to try it out immediately. I took the dough out of the freezer the day prior and transferred it to the refrigerator. I then took it out of the refrigerator and set it out on the counter for about and hour before rolling it out. It worked out great! Though for future, I might make a regular pizza dough instead of whole wheat. Whole wheat doughs tend to be more stiff than all all-purpose flour doughs. It was a little fussy in rolling out, but I made it work. Just not a pretty edge! On to the good stuff. I was slightly concerned about this pizza, mostly because I was completely winging it. The ingredients all go well together, but using a pesto that I’ve never tried before was a risk. But, I took a risk and it paid off, big time. Nate and I both loved it! 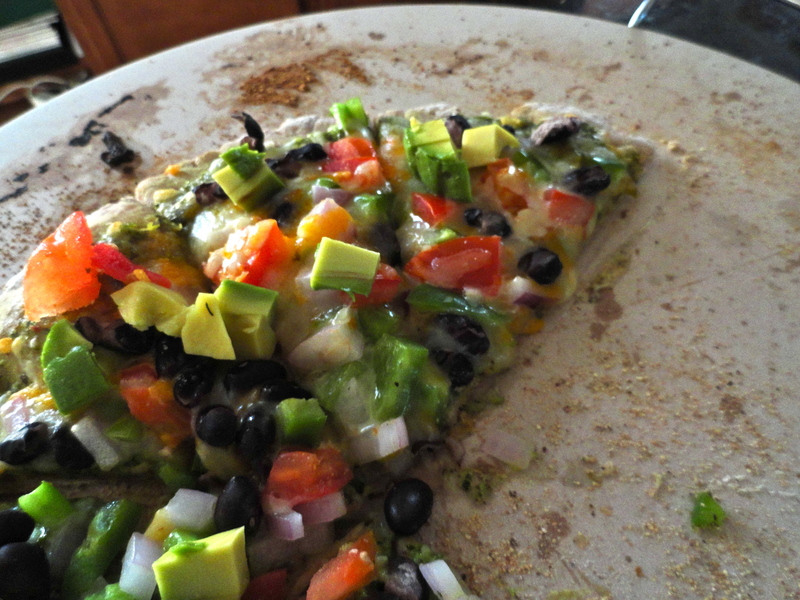 Of course I used cheese only on his side, so vegans could enjoy this pizza just as much as I did! I initially planned to add jalapeno, but I forgot. It was still wonderful. The cilantro pesto paired perfectly with the toppings. Nate said it tasted light and fresh, but I thought with the black beans and avocados, it was rich and creamy – but not heavy. So glad to have extra cilantro pesto to use in a variety of ways. I’ll be sure to keep you posted! 1. In the bowl of a food processor, combine cilantro, almonds, garlic, lemon juice and zest, salt and vegetable broth. While processing, stream in olive oil until pesto reaches desired consistency. Set aside. 2. Cook pizza dough to specifications instructions. 3. 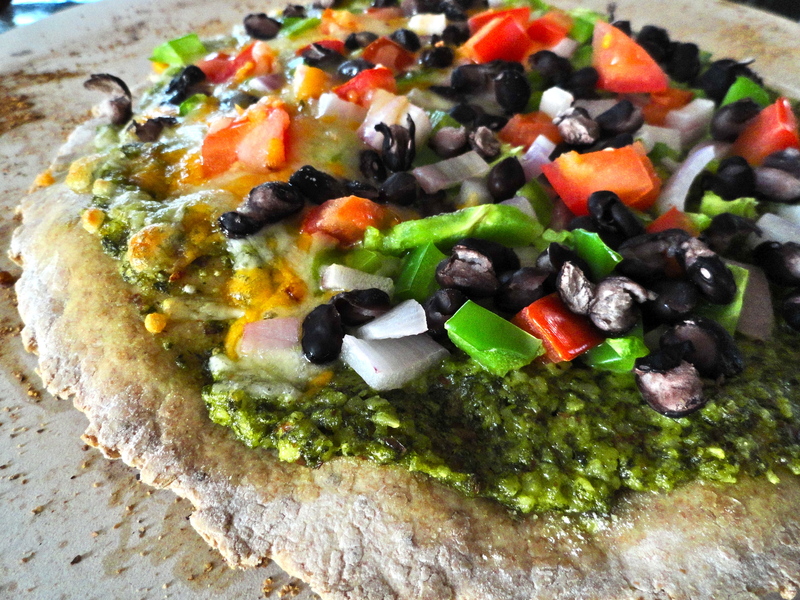 Spread 1/2 cup cilantro pesto over crust. 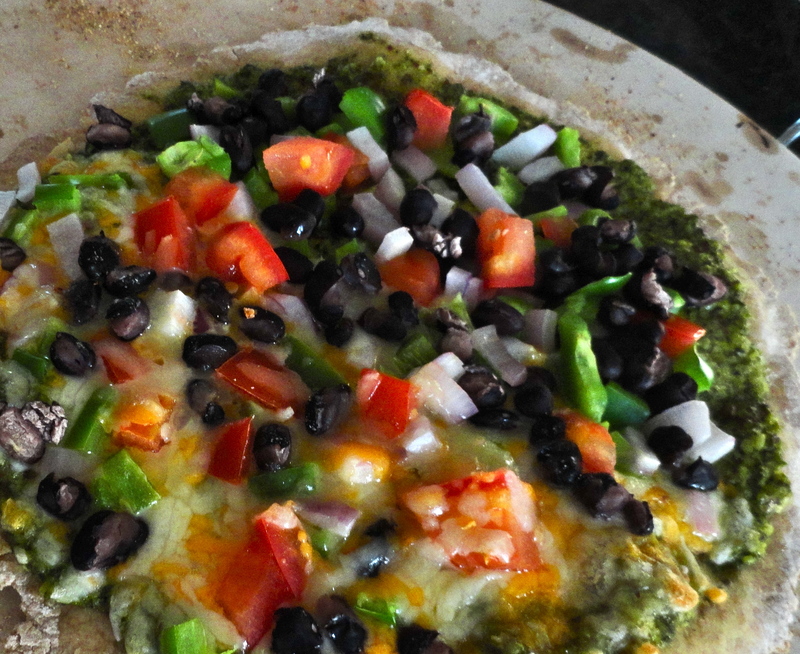 Sprinkle black beans, onions, peppers, tomato and cheese over pizza evenly. Return to oven and heat until cheese is melted and crust is desired crispness. Sprinkle avocado over the top and serve.